Martin O’Neill admits his side will be forced to defend for long periods in the upcoming World Cup play-off matches against Denmark. Martin O'Neill is hoping to guide Ireland to their first World Cup since 2002. MARTIN O’NEILL IS well aware of his side’s strengths and limitations. Against Wales last month, the Irish team earned a vital 1-0 victory that kept their World Cup qualification hopes alive, despite having just 29% of the ball over the course of the 90 minutes. With their upcoming opponents Denmark boasting some technically gifted players — most notably Tottenham star Christian Eriksen — O’Neill has suggested the play-off matches will pan out in a similar manner to last month’s fixture in Cardiff. 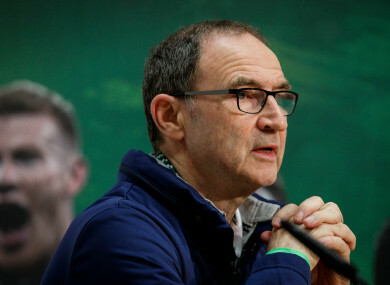 Looking ahead to the games, which take place on 11 and 14 November, O’Neill said: “(We must) stay in the competition, try to get an away goal for a start, try to be positive in the games. The most important thing is to get out there and be positive, no point sitting back wondering. We have got to do it, we have to go and play. There will be times that we have to play without the ball, but we’ve seen that umpteen times. We have to be able to deal with that for maybe a five, six, seven-minute spell against sides that are good at keeping it. We just have to stay in the game. “But the players have learned that over the last couple of years and I think the performance against Wales epitomised a lot about the side. The 65-year-old coach was unwilling to give too much away in terms of injury news, merely saying that some of his players were “carrying a few knocks and bruises”. Sean Maguire, James McCarthy, Jon Walters and Richard Keogh have all been ruled out through injury, while David Meyler is suspended for the first leg in Copenhagen. However, O’Neill is hopeful Jeff Hendrick will be available for the upcoming clash, despite the midfielder coming off injured in the Premier League for Burnley at the weekend. O’Neill also spoke how the Irish squad contains a number of players that could be called late bloomers. Now an established player (who is currently injured), an individual such as Walters was as old as 27 when he made his Ireland debut against Norway during the Giovanni Trapattoni era in 2010. Shane Duffy is less than two years younger James McCarthy, but has 15 caps compared to his team-mate’s 41. 27-year-old Harry Arter, meanwhile, was playing non-league football with Woking seven years ago. Moreover, in recent matches, 28-year-old Hull star David Meyler has developed from a fringe member of the squad to a key player, particularly with alternative midfield option McCarthy’s perennial injury problems and Glenn Whelan no longer an automatic starter at 33. It is vital, players have stepped up to the mark,” O’Neill says. “Players who maybe thought international football at this stage of their lives might be a bit beyond them. I think that’s the important thing. O’Neill is hopeful his players will be “mentally tuned in” for what will be two of the biggest games in their careers, as Ireland bid to reach the World Cup for the first time since 2002. “This is very, very important and even though we have done exceptionally well to get here, we must try to finish the job. Meanwhile, O’Neill is hesitant to say that Ireland playing the second leg at home is an advantage for the Boys in Green, particularly with a number of his key players at risk of picking up a second yellow card in Copenhagen (including James McClean and what is likely to be Ireland’s first choice back four and goalkeeper) and being suspended for the game at the Aviva. “I don’t think it’s possible to be able to deal with it, because players who are on yellow cards have to be careful, but even players who feel as if they are going strongly for a period of time, they might pick it up. “It seems a wee bit strange to have 10 games (in qualifying) and then find out (yellow cards still carry over into the play-offs). Email “‘There will be times that we have to play without the ball… Maybe a five, six, seven-minute spell’ ”. Feedback on “‘There will be times that we have to play without the ball… Maybe a five, six, seven-minute spell’ ”.